Research suggests as much as 93% of daily communication is non-verbal, which means relying solely on telephone calls and email to share complex ideas with clients and stakeholders is simply not enough. Today’s simple-to-use videoconferencing solutions are affordable and offer a perfect solution. From body posture and small gestures to facial expressions and eye movement, videoconferencing connects you face-to-face with the people most essential to the success of your business. 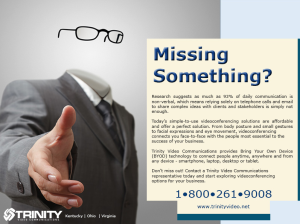 Trinity Video Communications provides Bring Your Own Device (BYOD) technology to connect people anytime, anywhere and from any device – smartphone, laptop, desktop or tablet. Don’t miss out! Contact a Trinity Video Communications representative today and start exploring videoconferencing options for your business. 1-800-261-9008.